Labour 24/7 is one of the fastest growing independent staffing agencies in the North West. With a reputation for high professionalism, recruitment and service industry knowledge we can handle your staffing needs. We realise that employers have a choice in where they go for their employment needs. Whether it is long term or short term, we can handle it. 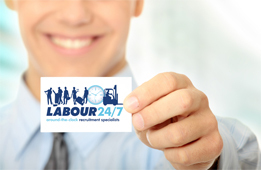 Labour 24/7 also understand that companies want a staffing supplier to care about their business, that’s why your account will be looked after by a director of Labour 24/7 who will ensure you get the service you require. We are 100% committed to getting the right people for you. The Labour 24/7 team have over 50 years? experience in the recruitment and service industry. We do not tell you what to do but ask what support does your business need from a business partner? Do you require the occasional help for, say 4 hours? Help for sickness or holidays or do you prefer the flexibility of a temporary workforce? As the name suggests we are here when you need us. As you can see we offer a fully tailored package for your recruitment needs. For any further information or to invite us to tender for a forthcoming project please call 0844 8241247 or contact either chris.sarsfield@labour247.co.uk or brian.loughran@labour247.co.uk.